I've been wanting a gallery wall in our house for a long time, but... there isn't exactly a good space for it. At least for the kind of grand gallery wall that I have been picturing. However, we did have a random little wall that needed something, so I deemed that space the perfect spot to share family photos. When Minted reached out with the opportunity to add some artwork, I jumped right on it & placed an order immediately! Right now is their Semi Annual Foil Event! These babies only go on sale twice a year, so snag a print while you can. The promotion runs until the 24th, so there are only a couple shopping days left. 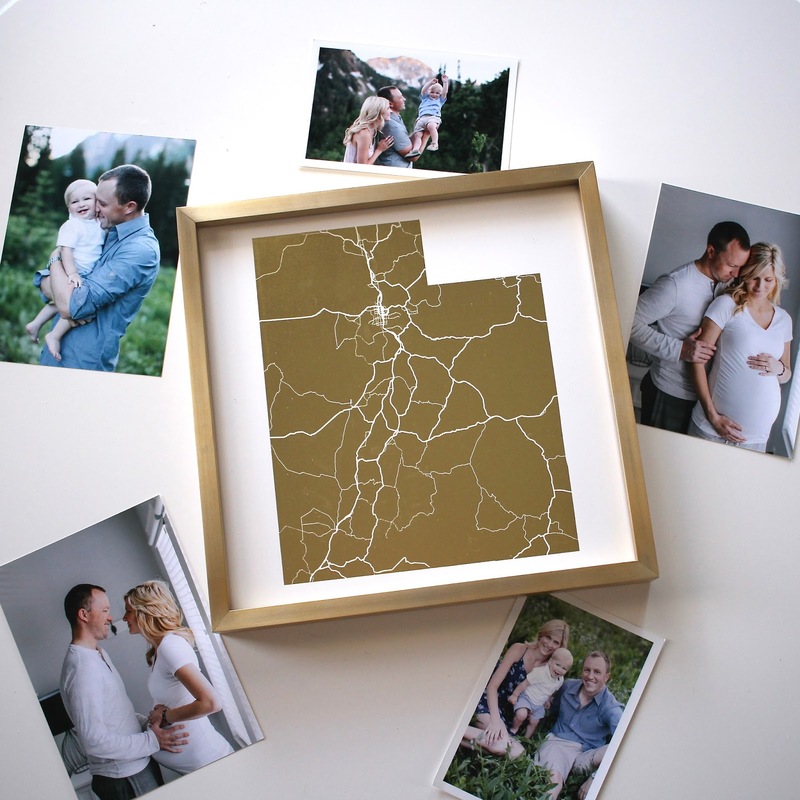 I'm loving everything from their quotes (i love you that is all), to their personalized art (custom footprints), but especially their state maps (Utah)! All of our recent family photos perfectly capture our now 4 plus years here; it seemed fitting to have a map of Utah in the center of all our photos. I never thought I'd have Utah pride, nor have anything in my home that was "Utah". But here I am, totally embracing the place we call home. Proud even, of the life we've started here. The city by the mountains that our boys are growing up in. This is likely not our forever place, but it's our right now. And right now we kinda sorta love it. And I know our boys do! There's a reason we refer to this place as Beautahful & Salt Lake Pretty! So if you have a little state love you want to share too, get your self a foil pressed state map! They are gorgeous. And they shine. And they'll make you happy. Or if you're feeling like you wanna get in the holiday spirt, and snag some fun Christmas prints long before the season begins, jump on that opportunity! Minted gifted me with free produced in exchange for my honest thoughts. I truly love the products & the company, so supporting them is easy. Affiliate links used as well. I love what you chose so much! Gah! Gorgeous! I love the foil states, and have been seriously swooning over them. 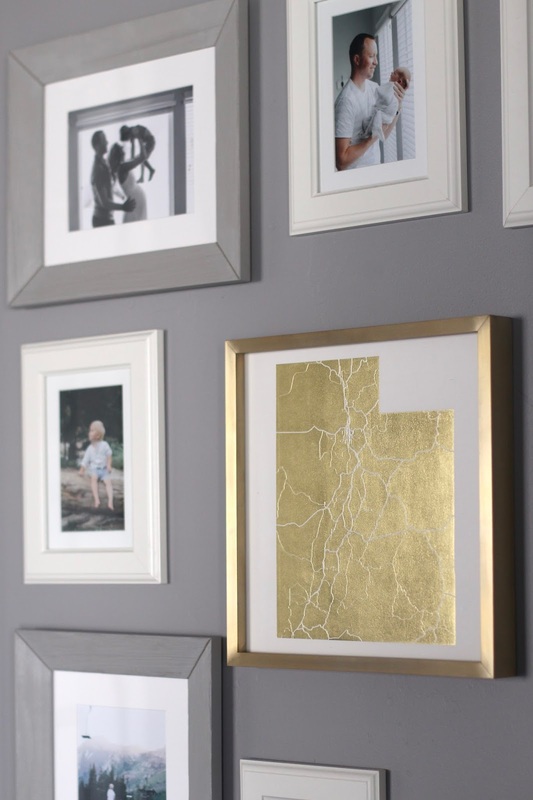 I love your gallery wall; what beautiful photos! I like your state map too. I wish I could say the same for loving our little state (Connecticut), but it's way too expensive to live here. On the bright side, I do love our little town, and for this reason, we'll continue to stay. I'm with you; it may not be our forever home, but it is our special place right now. 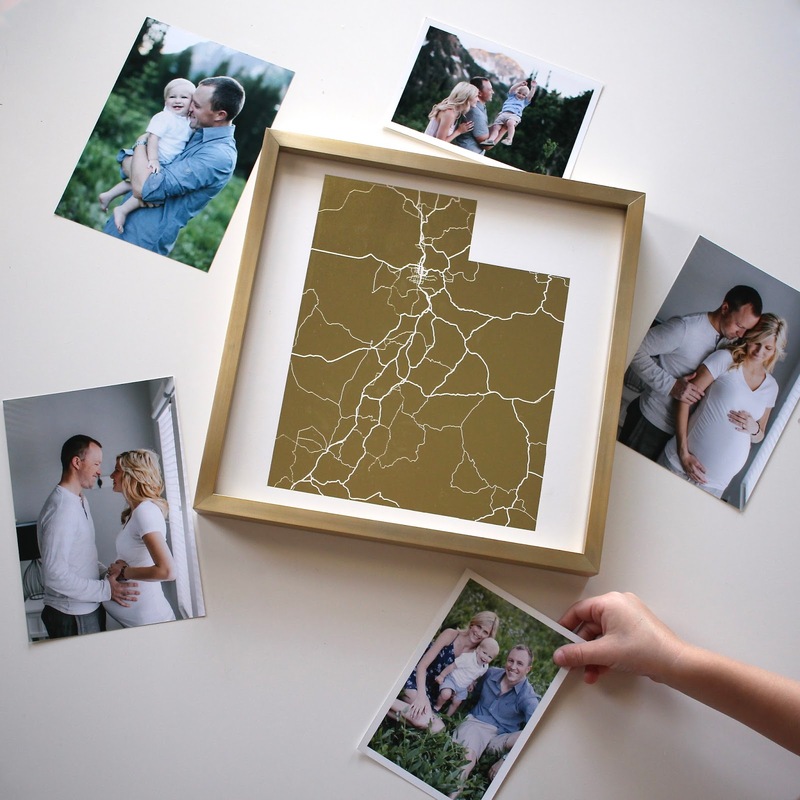 The Utah print is the perfect centerpiece for all of your beautiful photographs!